There is only one reason to reduce your pack weight and that is to make carrying it easier and more comfortable. If you don’t notice the weight on your back then reducing its weight is not going to achieve anything. A lighter weight load has no intrinsic superiority over a heavier one. But most of us do notice the weight on our backs and would be happy to reduce it, if that could be done without compromising safety or comfort (or costing a fortune). The lighter the load, the more enjoyable the walking. The question is how to lower the weight without making sacrifices that result in getting wet or cold because your clothing is inadequate or spending sleepless nights wriggling about on hard ground because your sleeping mat is too thin. Of course, as the saying goes, any fool can be uncomfortable and that can apply regardless of the weight of your gear. Indeed, in some cases lighter options perform better than heavier ones. A good down filled sleeping bag will keep you warmer than a much heavier synthetic one for example. What does your load weigh? The lighter your pack the further you can walk without feeling tired or your legs and feet aching. This doesn’t mean that lightening the load is only for those who want to cover big distances every day. Walking the same distance with a lighter load means you are fresher at the end of the day and more able to enjoy time in camp. You’re less likely to feel stiff the next day too. And the heavier the load, the more often you’ll need to stop for a rest and the sooner you’ll want to make camp. On the flat you probably won’t actually walk much slower with a heavy load but you will uphill - much, much slower. There are three ways to reduce the weight of an item. The first and most effective is not to carry it in the first place. That’s a 100% cut in its weight. However whilst this might work for spare clothing you don’t really need it’s not a good idea for your waterproof jacket, which you only hope you don’t need. The second way is to customise an item so it weighs less (see below). The third is to replace it with a lighter alternative. The often recommended way of going about the first option is to separate gear after a trip into stuff you used and stuff you didn’t use. I don’t actually think this is very helpful. Your first aid kit will hopefully be in the pile of stuff you didn’t use. That doesn’t mean you won’t need it next time. If it didn’t rain your waterproof jacket will be there too. And in the pile of stuff you did use there might be the spare warm top you wore in the tent but which you wouldn’t have missed if it had been left at home. Instead of this approach I suggest listing what you needed or might have needed and what you didn’t need. This is where you need to be ruthless. Many backpackers carry lots of spare clothing, maybe adding up to a kilo or more. Most of it isn’t actually needed. “Nice to have” and “need” are not the same. Once you’ve made such a list consider the “not needed” items to see which ones you would really, really miss. These are luxury items that add enough pleasure to a trip to be worth their weight. If you think you’ll enjoy the trip less without them transfer them to the “needed” column. I always used to carry a book to read in the tent when it was dark or stormy or even during long uninteresting road walks. A book obviously wasn't essential but I know from when I finished one before I reached anywhere I could buy another that I felt deprived without it. So for me a paperback or two was worth the weight. These days books have been replaced by an e-reader, again something that might seem unnecessary to others but which I wouldn't be without. What can be discarded are bits of gear that are often carried out of habit. Do you really need a candle in midsummer, enough dressings to cover a thousand blisters, the survival bag from your daysack when you have a tent? Don’t carry stuff just in case it might come in useful. It’s also worth looking for dual purpose items. Instead of that survival bag you could wrap yourself in the tent in the remote chance that you need emergency shelter where you can’t pitch it. Clothes in a stuffsack make a serviceable pillow. If the weather is unseasonably cold socks can be worn as mittens. A small cooking pot can double as a mug and a bowl for a solo backpacker. Rather than a sleeping bag liner take a thin set of base layers that can also be worn during the day in chilly weather. The traditional cliché about lightening your load by customising gear is to cut the handle off your toothbrush. Even if you’ve saved every other gram you can that still wouldn’t make a noticeable difference however. Saving a few grams per item on many pieces of gear does add up but even then it probably won’t be very significant. It’s all about how it feels on your back. 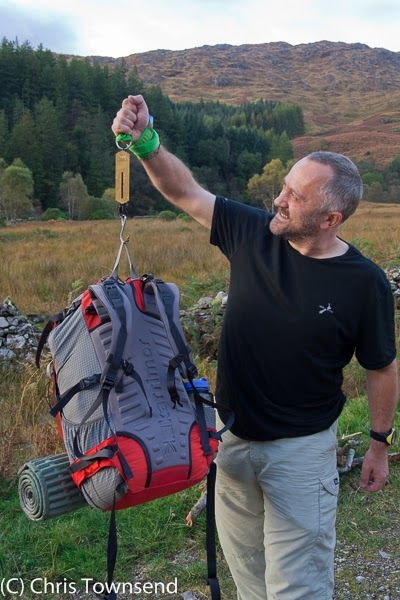 Only if your load is already ultralight – under 5kg say – will you notice tiny reductions in the weight of gear that isn’t very heavy to start with. It’s the big items that matter – pack, tent, sleeping bag, sleeping mat, stove. If together these weigh 6-9kg, as they easily can, shaving a few grams off a cooking pot or a pair of socks isn’t worth the effort. Knowing the actual weight of your gear is a starting point – and I mean weighing it yourself, not assuming makers’ weights are correct as they often aren’t and when wrong they tend to be on the low side. And don’t assume that if an item is described as lightweight it actually is – some companies have peculiar ideas as to what lightweight means. Also, look at what is included in the weight. The minimum weights for some tents don’t include pegs. There can be a weight variance in the same products too. If you take your scales into the shop you can weigh the specific item you’re buying. If you already have the main backpacking items aren’t you stuck with that weight? Not necessarily. Gear can be customised to reduce its weight a little. Straps you never use on a pack can be cut off and maybe the frame can be removed – at least for those shorter trips when the overall weight isn’t high to begin with – and also the lid. Tents often come with hefty pegs and thick guylines that can be replaced with much lighter weight ones. If it’s a two-skin tent perhaps the inner can be left behind and a simple groundsheet used instead, which not only saves weight but gives you extra space. Sleeping bags are harder to customise though I do have one friend who removed the zip and turned his bag into a quilt. All this done you still won’t make a big dent in the weight of the big items so these are the ones that you might well plan on replacing over time if you really want to cut the weight you carry. Again, check the weight and look at alternatives. If your empty pack or your tent weighs over 2kg, as many models do, there are plenty of lighter alternatives that will perform as well. However if your pack or tent weighs 1kg or less then the options for weight reduction are much less. It makes sense to first replace those items where the most weight can be saved. Keeping weight in mind when choosing gear is a way to avoid being seduced by amazing but heavy designs. Lighter gear usually means simpler designs. Bells and whistles add weight. They may seem functional but ask yourself if you really need them. How many pockets on clothing or on your pack do you actually use? 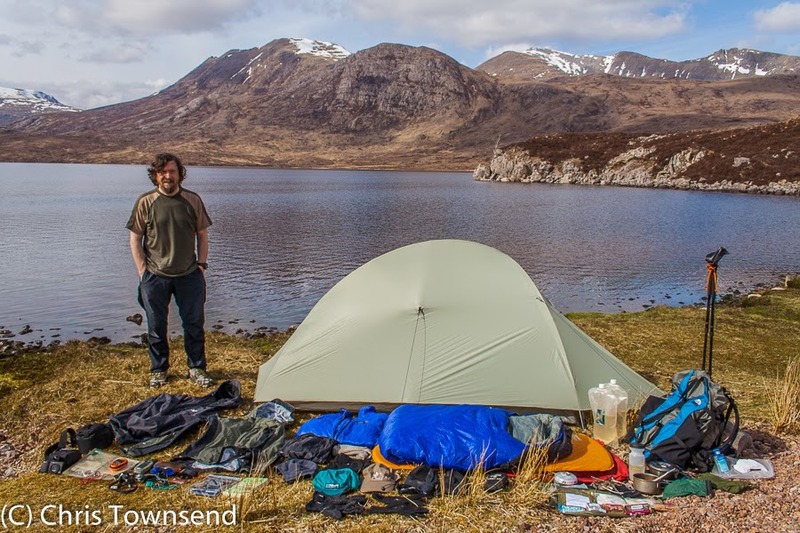 Do you need reinforced clothing designed for mountaineering or a tent that will withstand a blizzard on the Cairngorm Plateau for backpacking a long distance footpath in summer? Looking at the big items let’s start with the pack itself. Heavy packs are great for heavy loads. But if you’re load is around 10 kilos, say, you don’t need a pack designed to carry 20 kilos. Lighter loads are usually more compact loads so your pack needn’t be as big, which also saves weight. A guide I’ve used for years is that a pack shouldn’t weigh more than 10% of the total load (that is, with food and water as well as gear). So for that 10 kilo load the empty pack should weigh no more than a kilo. With shelters a solo model needn’t weigh more than 1.5kg and many weigh much less. Sleeping bags for temperatures above freezing needn’t weigh more than 800 grams and sleeping mats no more than 400 grams. So the total weight of these four big items of gear needn’t reach 4kg (in his book Smarter Backpacking Jorgen Johansson sets a target of 3 kilos for these items – I think this is ambitious, though I achieved it on the Pacific Northwest Trail, those items weighing 2.9kg, at least until I changed my pack for a more supportive but heavier one and the weight went up by nearly half a kilo). 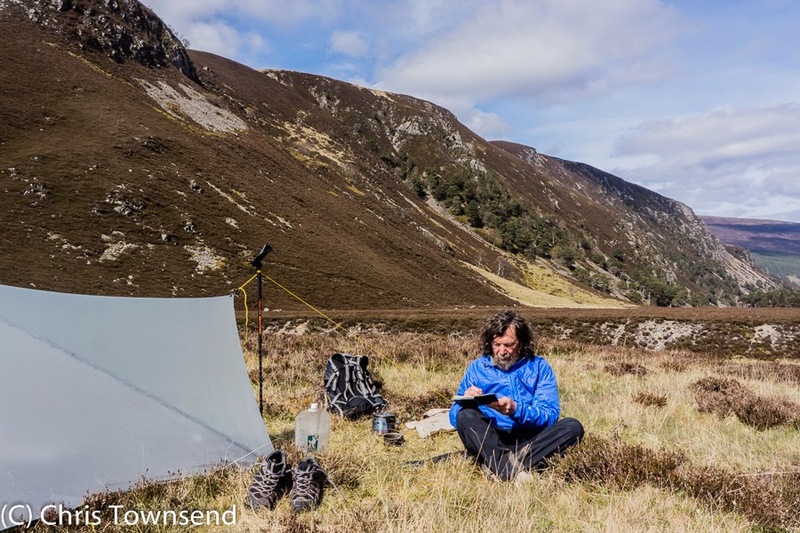 Having been tempted by heavy gear myself in the past – my pack weight went up during the 1980s and early 90s with tent, pack, stove, pans and clothing all increasing in weight – I set myself maximum target weighs for every item of gear. If something weighs more than this I reject it immediately. And I try hard to get the weight well under this target. I also have a target for the maximum my pack should weigh for a trip, without food, water or camera gear (of which I carry more than most for photos for articles and books). This base weight doesn’t vary with the length of the trip, just with the season. For 3-season backpacking (May to October inclusive) my target is 7kg, which was my base weight for the Pacific Northwest Trail. In colder weather it goes up by at least a kilo due to more clothing and warmer sleeping bag. When there’s snow and ice on the hills another kilo is added for ice axe and crampons. This is all for solo backpacking. Duos who share tent and cooking gear should be able to knock at least a kilo off those weights. Finally, don’t forget footwear. A kilo on your feet equals two or three kilos on your back. Going from 2 kilo traditional boots to 1 kilo lightweight boots or trail shoes is the same as knocking a kilo off your empty pack weight and a kilo off your tent weight. I’d reduce footwear weight before anything else. 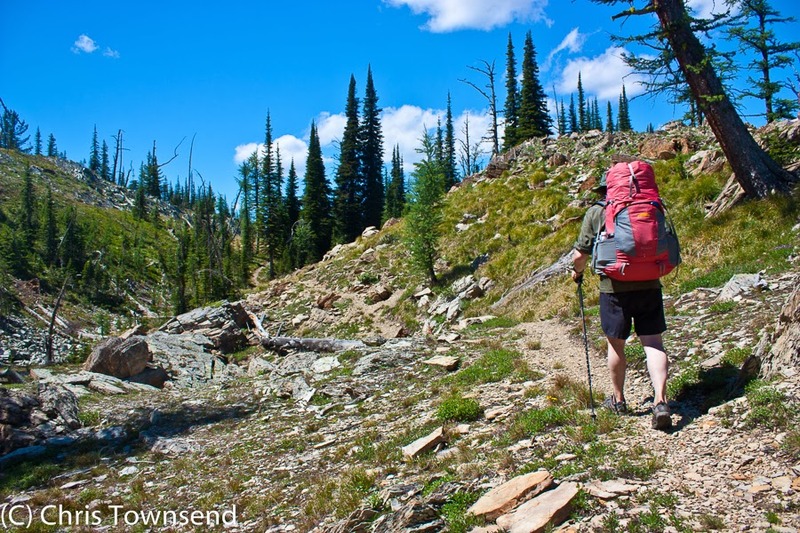 As indeed I did many years ago on the Pacific Crest Trail when I discovered that carrying my boots and walking in the running shoes I’d brought for camp and town wear was less tiring even though the weight on my back went up by over a kilo. Great article, Chris. Thanks. Even though I've read numerous similar articles and I'm well on the way in lightening my pack I respect and can clearly interpret your opinions and advice. Looking forward to putting it to use in the coming months, particularly in May for my first visit to the Cairngorms. In connection with this I e-mailed Professor Stephen Legg in Australia, who did a lot of research on weight of footwear and energy expenditure some years ago. I quote him at the end of the blog posting and he agreed that the old Everest expedition adage from 1953 still seems to hold: That a pound on your foot equeals five pounds on your back. So I am of course interested in hearing if you've come across some more recent research supporting that "a kilo on your feet equals two or three kilos on your back". Good read. My revelation was changing from boots to trail shoes after reading your book. I couldn't believe the difference it made. Then using shelters that use hiking poles to pitch - saves weight and no fiddly pole sleeves to battle in wind and rain! Very good Chris. As true now as when your wrote the article. Ever since I bought and read The Backpackers Handbook in 1998, I've enjoyed your methodology and logic. 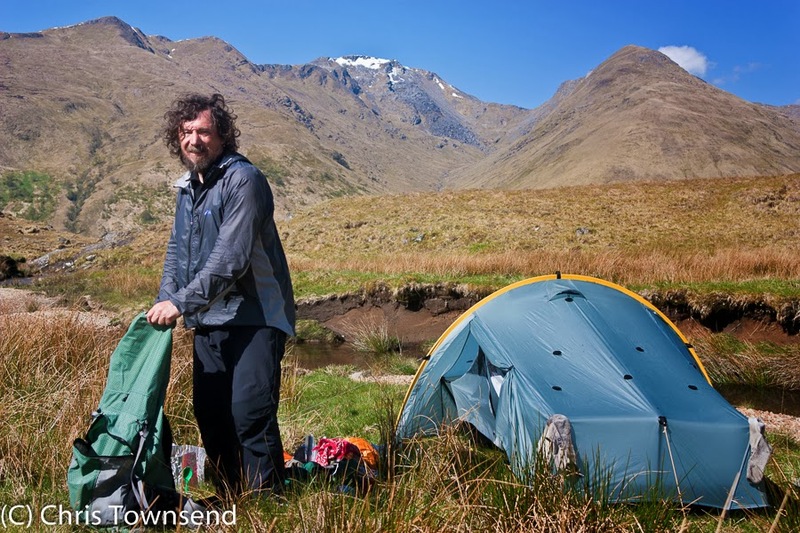 At the time, your approach chimed with my own then recent experience; as a student in Edinburgh, I'd enjoyed camping and backpacking trips in the Highlands, albeit with cheap (and heavy) kit. After I graduated in 1995, found employment and had a little money to spend, I replaced my old heavy synthetic sleeping bag with a light goose down bag, replaced my heavy (and leaky) tent with a lightweight (and weatherproof) model as well as investing in items such as a 3/4 length inflatable mattress. This transformed the weight on my back and my ability to cover terrain without undue fatigue as well as my overall comfort levels both on the trail and in camp. It's the big items that make the difference. All of this is still true 20 years later. Thanks for highlighting the message once more. Thanks Chris, definitely put a clearer picture in my mind of where I can make a big reduction in pack weight. This article confirms what I'm learning from many sources. It was great to hear your views on this too. I've been reading your popular books, specifically am reading "Crossing Arizona" at this time. I sure am enjoying the details. Thanks to Tony Hobbs, I discovered you too Chris! You encourage me forward in this endeavor of hiking. Thank you. A good friend of mine offers the advice that as "we get older we get weaker but, (hopefully) wiser!" I think he's right. I'm far more interested in the weight of my gear now (age 52) than I was in my 30's and early 40's when I just packed and went off on as many long trips as possible. Rucsac weight was always secondary to trip planning and the excitement of new trekking destinations. Great advice Chris and inspirational photos.